Three Shapleigh School seventh graders - Jasmine Dodge, Hannah Hofferbert and Hope Sawicki - were recently published in an anthology of student writings. 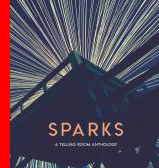 Dodge, Hofferbert and Sawicki were selected out of nearly 500 entries to be included in The Telling Room's anthology, Sparks. These girls, along with 14 other seventh grade students, participated in a writing residence funded by the Kittery K-8 PTA. Dodge's poem, titled "A Turn for the Worst", is told from her point of view about the separation of her parents. Hofferbert's poem, "Water on My Skin", is about one unforgettable summer day in the pool while visiting her Nana's house. Sawicki's poem, "Where Does Rain Come From? ", is about driving through a storm and all the thoughts you might have along the way. The Telling Room is is a nonprofit writing center in Portland, Maine, dedicated to the idea that children and young adults are natural storytellers. Focused on young writers ages 6 to 18, we seek to build confidence, strengthen literacy skills, and provide real audiences for our students. Dodge, Hofferbert and Sawicki are three of more than 3,300 students The Telling Room has served in the past year. These three girls took part in Big Night, The Telling Room's annual celebration of student writing and official anthology release, on Tuesday, May 23, 2017. For more information, visit http://www.tellingroom.org. Thank you to seventh grade language arts teacher Nancy Sebert, and gifted and talented instructor Blayne Matty, for supporting these girls and their efforts.